What is SK8 CLUB About? Musicians helping out. Getting Together With Other Skaters. Helping Each Other Learn How to Skate. Encouraging & Inspiring Each Other. Going on Skate Outings & Trips Together. Building Relationships & Making Friends. Learning How to Build Skate Obstacles. Encouraging Creativity & Uniqueness. Synergy and Celebrating Our Differences. Working Together as a Team. SK8 CLUB UNITED is a non-profit organization that offers individuals and families the opportunity to experience the art and freedom of Skating through organized meet-ups and events, as well as providing skateboards, roller skates, and necessary safety gear for those who need it. 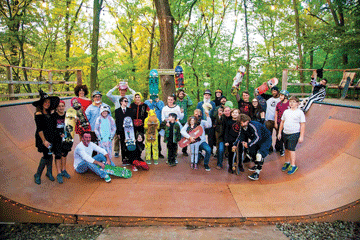 The mission of SK8 CLUB UNITED is to build relationships, encourage and inspire, and celebrate individuality while helping people learn how to Skate and work together as a team. Build relationships, encourage and inspire, and celebrate individuality while helping people learn how to skate and work together as a team.